Now you've learned your units, you're being aggressive, you've learned to scout, and you're watching replays to get better. But how do you stack up against everyone else? This is where leagues and divisions come into play. 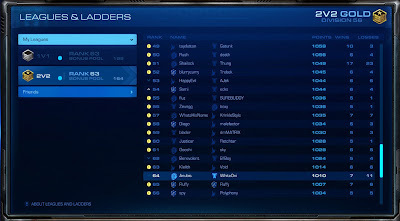 There are currently 5 ranked leagues in StarCraft 2. 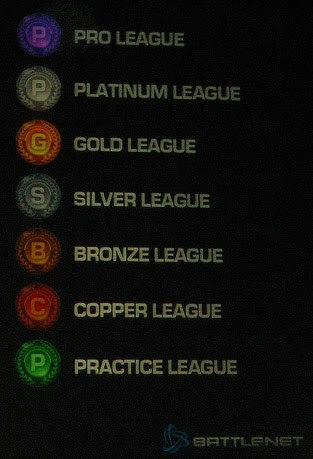 From least skilled to most skilled they are Bronze, Silver, Gold, Platinum, and Diamond. There is also a practice league for - you guessed it - practice. Last time I checked, the practice league has the game speed set slower than the ranked leagues. This means you have more time to think through your actions and react to events that happen throughout each game. It is meant as an on-ramp to the ranked leagues. There's speculation - based on posts by Blizzard - that StarCraft 2 will also have a Pro league. Pro league would be invite only and reserved for the best of the best. It hasn't been implemented yet, but don't be surprised to see it introduced in the retail release. 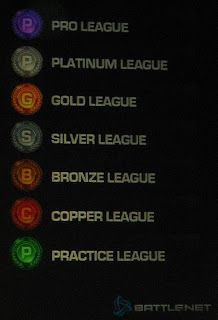 To be placed in the correct league - according to your skill level - you are required to play a series of placement matches. For every game type you play 5 placement matches and are then assigned to a league. Each game type is ranked independently of one another. You will need to play a set of placement matches for your 1v1, 2v2, 3v3, and 4v4 games. 20 placement matches total. You are also assigned a different placement for each pre-made team of players you play with. For example: You and Friend X play all your placement matches and are put in gold league. When you and Friend Y play for the first time you will have to do 5 more placement matches and may end up in Bronze league. Keep in mind that every game type and set of friends you play with are ranked independently of each other. You can be ranked in Bronze league for 1v1 games, Gold for random 2v2, and Platinum for 2v2 games with a friend. Divisions exist to easily see how you rank against a set group of players within your league. The Division number does not matter. Your place within the division does matter. You are randomly assigned to a group of 100 people representing a range of skill within your league. The other thing that does matter is your rating number. It starts around 1000 and changes depending on your wins and losses. This number determines where you are in the division and the league. The short version: Win games. As you win games your rating number goes up. If you lose games your rating number will go down. If your rating number is high enough the matchmaking system will start putting you into games against opponents in the league above you. But it won't let you know that it's pairing you up with a different league. It's like a stealth trial of your skill. If you win enough games against opponents in the league above you then you will advance into that league. Tournaments are going to be implemented in a later build. Not a lot of information is available yet, but the thought is that everyone above a certain rating in each division will be eligible to play in tournaments in their own league. Good guide keep cuntinue with this things.